"It took ten days for the Federal people to get their foolish, quacking ducks in a row. 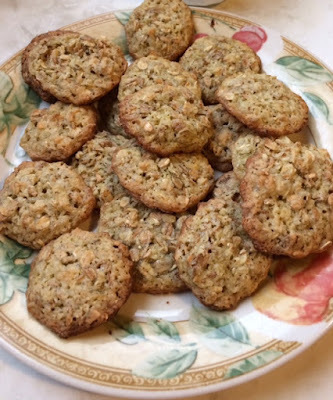 So I drove downstate to pick up Ellie on the first real day of spring... Before I left, I had baked a batch of oatmeal-lace cookies, by rights a summer delicacy to be enjoyed with iced tea, but on the grounds that you never know what tomorrow may bring, I had decided to do it now." 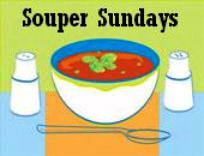 As I did for my women's prayer group, serving them with coffee and an assortment of teas. 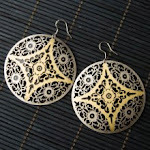 They didn't turn out all that lacy, but good just the same. 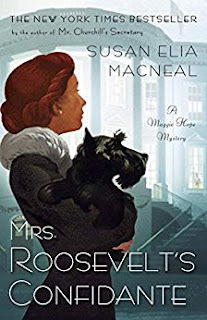 My other example of intrepid heroines is also from a series, the Maggie Hope Mysteries, by Susan Elia Macneal, which take place during World War II. This one, Mrs. Roosevelt's Confidante, is her fifth. Maggie is an interrupted, genius level mathematician (having left her studies to help in the War effort), an expert code breaker, and trained special agent with Churchill's SOE espionage unit. I loved how she foils an after hours attack. It does not turn out well for the mugger. In this novel a case of political sabotage through lies and murder is foiled with the help of our heroine. I would recommend starting with the first of the series, Mr.Churchhill's Secretary. Maggie develops in competence and skill from book to book. I've enjoyed them all so far. When Churchhill visits the U.S. for conferences with Roosevelt, just after Pearl Harbor, the President enjoys mixing up martinis and special drinks for his guests. The author provided Roosevelt's martini recipe at the end of the book, so of course I've included it here. Shake gin, vermouth, and olive brine in a container half-filled with chipped ice. When reading a novel, and I come across a mention of food for which I would like the recipe, there is always the very reliable, The Joy of Cooking! A stand-by cookbook, which has been in use in my kitchen for years - I'm now on my duct-taped second copy. 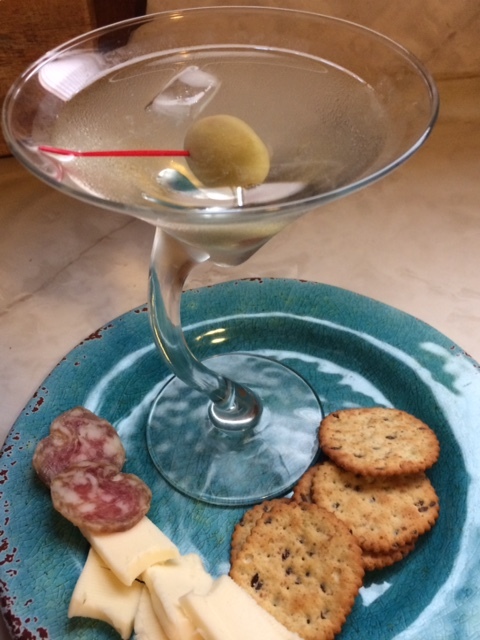 I do think the martini goes best with some cheese and crackers or pate and toast points if you're in a White House celebratory or party mode. 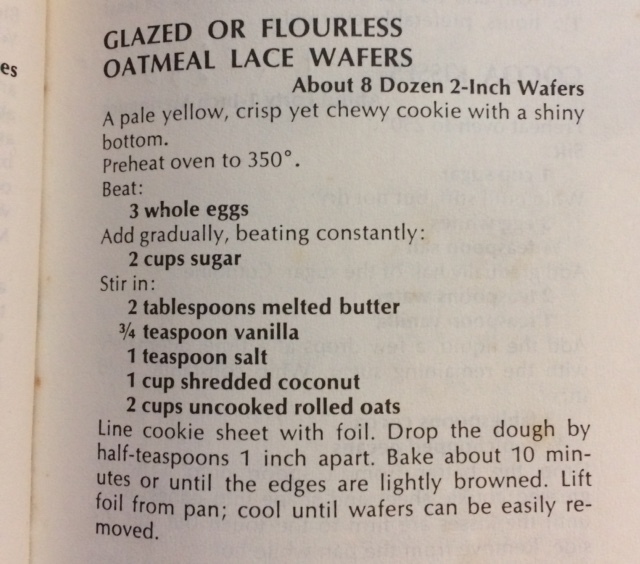 As for the excellent, sweet, but not too sweet, Oatmeal Lace cookies, I would recommend having them with a cup of tea or coffee. 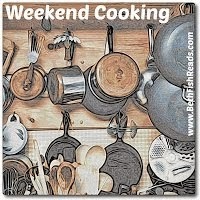 This book and cooking duo post will go over to Simona for the 35th edition of Novel Food which she is presently hosting, and to Beth Fish Reads for her Weekend Cooking event. I also enjoy a novel with a competent female protagonist, even more if it is also a mystery. I will check the ones you describe. 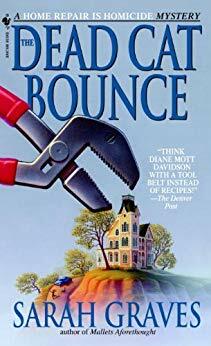 And in the spirit of sharing recommendations, do you know the Charles Todd's series featuring Bess Crawford? The first one is titled "A Duty to the Dead" The novels are set during WWI and Bess is a nurse at the front. Thanks Simona, and for the book reminder as well, I'd read the Todd (Mother and Son duo) books up until Pattern of Lies, which I just reserved. Somehow they'd gotten off my radar. I've been meaning to read the first MacNeal book -- and I think a martini would be a great accompaniment. 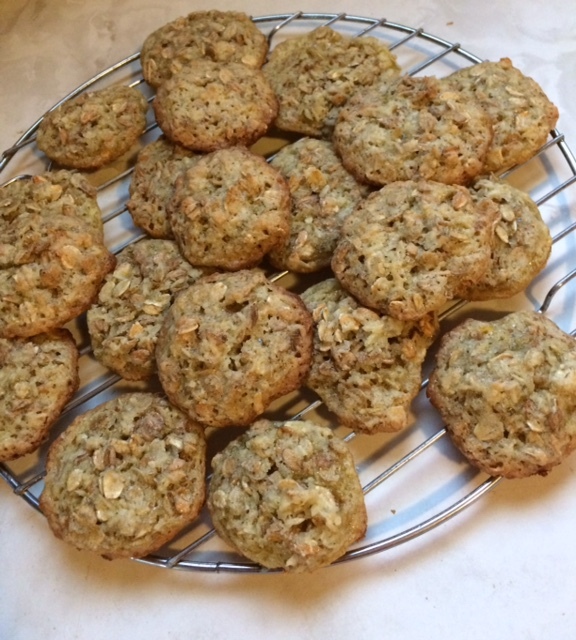 Oatmeal cookies of any kind are always welcome as far as I'm concerned! 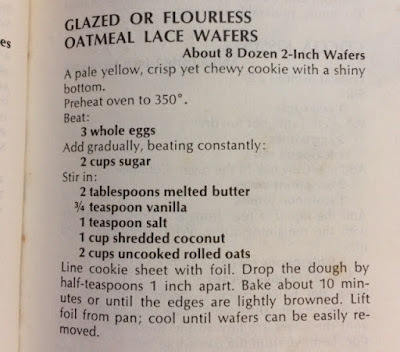 My Joy of Cooking is probably an earlier edition than yours, and it has the identical recipe but titled “Glazed or Flourless Oatmeal Wafers.” I wrote in the margin “NO GOOD!” so I guess my one and only try was not as tasty as yours! The page itself is stained and the ribbon marker that came with the book is on that page because the next column has Peanut Butter Cookies which are one of my top faves. As far as I can tell, no version of this recipe appears in the much updated Joy of Cooking App! Enjoyed hearing about both books and am now drooling over those oatmeal lace cookies.